Les Traversées Tatihou is of course not the biggest or best known festival in Europe - but sometimes the smaller festivals are much more interesting. This festival in a remote place of Normandy impressed me a lot - it is a very special festival. If you are some time at the right time nearby, do not hesitate and visit this great place. Tatihou is a small nearly uninhabited island - as far as I know, only the owner of the restaurant and a warden live on it. Besides the restaurant there is an old fortification tower of the famous French builder Vauban, a bird sanctuary, a maritime museum, lodgings for a few people and some nice gardens. As you can imagine it is not a very big, but a fascinating place to be - especially for some days in august, when many people come to this island to enjoy some of the best folk music. Enough about all the touristic highlights, lets get back to the festival. It takes place for a long week in mid august. This year it started with a regatta around the island Tatihou on a Sunday afternoon. 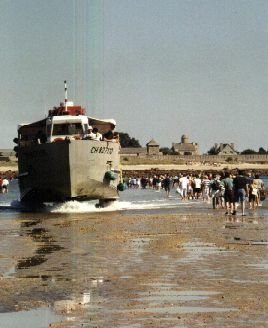 The music started on Tuesday on the mainland, in the harbour of St Vaast-la-Hougue as a (free and open air) village festival. In the afternoon and evening some very enjoyable concerts took place in a special surrounding - you could see all the boats directly next to the stage, and if you where looking a bit further, you could see the small island of Tatihou in the background... Many inhabitants and friends of good music gathered around the stage to have a good start of the festival. On Saturday the main part of the festival started with concerts directly on the small island. There are four days with concerts on the island, mostly these are theme teams of two bands presenting in one concert highlights of a particular region. These concerts are arranged with a close look at the tide time table, because to come to enjoy the concerts the most common way is to walk to the island, as soon as the tide allows to cross bare feet to the island. This crossing is one of the most special things of this festival. It is really amazing to watch lots of people - from young children to older people - walking, mostly in either wellingtons or beach sandals on the path towards the island. If it is the first time you see this it surely will impress you as much as I was impressed by it! Although there is a guide who will show the path to those people who never have been on the island, many of the festival goers start walking towards the island much earlier - as soon as the water allows to cross with just wet feet (and sometimes trousers etc...) - to secure a good seat in the tent, where the concerts are held. All the concerts start sharp in time, at a time when everybody easily could arrive from crossing by feet. They last for good two hours, because afterwards all visitors have to walk back again to the mainland before the tide comes in again. 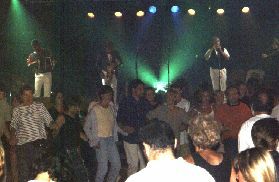 In the late evenings you could enjoy some more music in the bars in St Vaast and prepare yourself for the next day's journey to the island. The themes of this year's festival where a Flemish (northern Belgium), a Scandinavian, a southern Italian and a Shetland afternoon/evening. All groups where selected with a lot of care, each has a very high musical standard - and the special thing is that many of the bands are quite unknown, at least in this part of France. The audience of this festival is very open minded and seems to enjoy it very much to explore new musical highlights on this festival. Saturday was the Flemish starting point of the series of concerts on the island of Tatihou. At this concert you could explore two legendary and very famous groups of the scene. Both exist for more than a quarter century now and are pioneers of the whole Flemish folk scene. Nevertheless both bands are very different - first on was the quartet t'Klieske. This is the oldest band still playing Flemish traditional material in Belgium, maybe it would be right to describe them as the godfathers of the current folk scene in Flanders. t'Klieske is an acoustic band focussing on songs in the Flemish language. Their shows are more than only music - they have many elements to fascinate both the many children and the adults as well. For example the four table dancing marionettes where a nice end to their show. In the short interval I had the chance to look at all the fellow 'tide walkers' - and it was quite fascinating to watch the interesting chic of this festival (wellington and evening dress etc. - very enjoyable to watch all this folk). In the meantime the stage was set up for the second band of the concert: Kadril. Kadril is a Flemish folk rock band, who has published this summer a special CD to celebrate their 25th anniversary as a band. It is fascinating to watch this (quite young looking) band, who has lots of fun on stage, and whose music sounds fresh and unspoilt, and to know that this band was maybe the most influential band for the current absolutely stunning boom of new young folk music in Flanders. By the way, Erwin Libbrecht, guitarist of Kadril, has given another big input in the Flemish folk scene - he has started about three years ago today's most influential folk music label in Flanders. With this he has encouraged bands like Lais or Ambrozijn - the flag ships of the current Flemish scene. Kadril are an eightpiece band around the brothers Libbrecht, the band found their new focal point in the young excellent female singer Eva. Eva is a great singer, who can create good atmosphere, she is backed by the boys. On the one hand Kadril has the 'classical' rock element in drums, bass, guitar, keyboard etc. - on the other hand a wide range of traditional instruments like two beautiful hurdy-gurdies, bagpipe, dulcimer, nyckelharpa (a keyed fiddle nowadays played mostly in Sweden), accordion and flutes. This excellent and wide field of traditional instruments offers a big variety of different sounds - and as Erwin told me all the traditional instruments were played traditionally in Belgium in one time or another. Especially together with Eva the boys of Kadril are playing at the top of the European folk music scene. Happy anniversary and good luck for the next 25 years! On Sunday afternoon a Scandinavian feast was held - in contrast to the old established bands of the Flemish concert, the two bands from Scandinavian bands were young and very promising, both groups have made a good name in one part of the world or another. First on was Plommon, five young girls from Sweden, all five are excellent fiddlers, but their music has a lot more to offer. The young girls of Plommon had in Tatihou their first ever appearance in France (although they are an established part in e.g. the German folk music scene). Besides the fiddle they play recorder and a very interesting tramp organ (build out of a suitcase) - and of course they can sing. Their combined singing is beautiful and as a band they can create a very relaxed and special atmosphere. The audience loved their appearance on the island. Second band Gjallarhorn has a totally different approach. Gjallarhorn hails from Finland, but the music is mostly steeped in the traditions of the Swedish minority of Finland. Although their music is deeply rooted in Scandinavian tradition, it exploits some new grounds. Their (mostly) acoustic music has many influences from more modern sounds and from world music. Their combination of instruments is special: besides the singing and fiddle playing (including the Norwegian hardangerfele) focal point of Jenny Wilhelms, there is a viola player, a percussionist, with many different percussion instrument from different backgrounds and a slideridoo (a special form of the didgeridoo) player. Their sound is full and very groovy and their approach very innovative. The combination of two so different bands shows in a very good manner how broad today's European folk music scene is. Next band on was Filska, three young girls (all playing among others the typical Shetland fiddle) backed by an guitarist. Their music contained many beautiful Shetland tunes, with their typical fiery musical edges. Besides the tunes some songs - mostly of contemporary songwriters - were added in a quite unusual and modern manner. As highlight of the concert both bands joined together on stage for a little session. First on where Les Maganés playing Quebecois music. 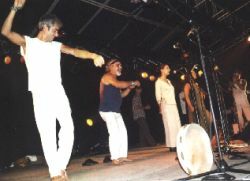 The second band had a totally different background: Tarabanda played southern Italian music - the dances of that region differ very much from those danced before - end of the ball and the whole festival was Menez Tan, an excellent innovative Breton Fest Noz band. Many folks joined the lines to dance the night away till the end. This was a very special night, which will be remembered for a long time for all attending folks. The musical quality of the whole festival was excellent - even though most of the audience did not know the bands before, all concerts where sold out. The organisers have made such a good name at this festival, that the people know, the selected groups are excellent, and they will have a great time at the island. The whole festival is very much a family affair - many children attend the festival - the 'journey to the island Tatihou' is surely a great adventure for them. All in all a genius festival with a unique atmosphere! If you are sometime at the right time near, do not hesitate make your way to Tatihou. To all involved in organising the festival a big 'merci beaucoup' - and all the best for the next festivals!!! Festival homepage can be found on the homepage of the island Tatihou.